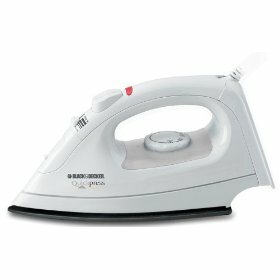 I wanted to find an iron that was not too big and bulky because sometimes i have arthritis, but i also do quite a bit of ironing every week. Most of the irons have had digital and other things added which means they need more room to add it on, and that is one of the reasons they are bigger. This iron weighs no more than 5 lbs. The Black & Decker AS75 Quick Spray Iron has been such a good iron for me. Two things stand out as far as i am concerned: the non-stick plate and the sprayer. Nothing ever sticks on this iron because of the heavy duty non stick plate and the sprayer has a blast to it that will get out the hardest of wrinkles. This is a 1200 watt iron that sells for around $25. What impressed me the most is the amount of clothes i can iron just filling up the water reservoir once. I know you will probably love the way it handles as much as i do because its so lightweight. To me, that means i can iron a lot more clothes a lot faster.